Few activities are more satisfying than creating a living space that reflects your unique personality. Our Springs apartment homes accommodate a wide variety of decorating styles, so they provide a perfect backdrop to showcase your creativity and flair. Maybe you have clear ideas about designs that you like, but you're unsure of how to go about executing them. Perhaps your tastes run across a variety of styles and you want to know how to blend them together harmoniously. Whatever your decorating question is, chances are that someone has found an answer to it. 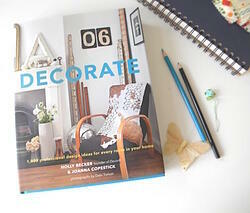 Decorating books that focus on apartment living are a valuable resource to help you fulfill your vision. You can take advantage of the know-how of design experts and browse pictures that give you a visual guide. Here is a guide to some of the best titles on bookstore shelves. First published in 1896, House Beautiful has been the gold standard for interior decorating ideas and tips. The Apartment Book: Smart Decorating for Any Room is their classic guide that is periodically updated to keep pace with current trends. Each room gets its own section showing appropriate techniques and tips. Noted designers such as Jonathan Adler and Kelly Wearstler give you the benefit of their experience in Decorate: 1,000 Design Ideas for Every Room in Your Home. This book offers the answer to any question you have and many that you haven't even thought of. Popular decor magazine Domino is the basis for The Book of Decorating: A Room-by-Room Guide to Creating a Home That Makes You Happy. The book includes a helpful review of budget, function and other vital considerations to answer before starting your plan. Domino is also the genesis for The Perfectly Imperfect Home. Author Deborah Needleman was its founding editor-in-chief and has since gone on to the same position at the New York Times Style Magazine. Her book offers humorous but knowledgeable ideas for creating a stylish decor that looks like a home, not a museum. Apartment Therapy Presents: Real Homes, Real People, Hundreds of Design Solutions is from the people who created the popular website that draws more than three million viewers per month. The book follows the same format of showing pictures and giving how-to steps for hundreds of real-life decorating ideas. These books will give you plenty of material to jump-start your own creative juices. Have fun designing a home that is unlike any other because it showcases your individuality!